CHICAGO, BRUSSELS – May 20, 2012 – Northrop Grumman Corporation (NYSE:NOC) has announced it has signed a $1.7 billion (€1.2 billion) contract for NATO's Alliance Ground Surveillance (AGS) system. 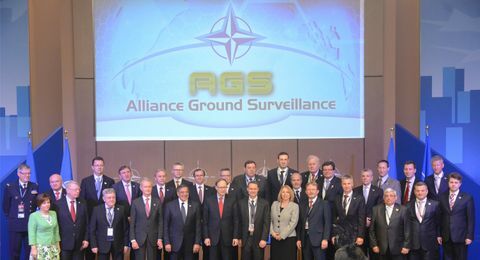 Operating under NATO command, AGS is expected to be the major data source for NATO's system for Joint Intelligence, Surveillance and Reconnaissance (JISR). 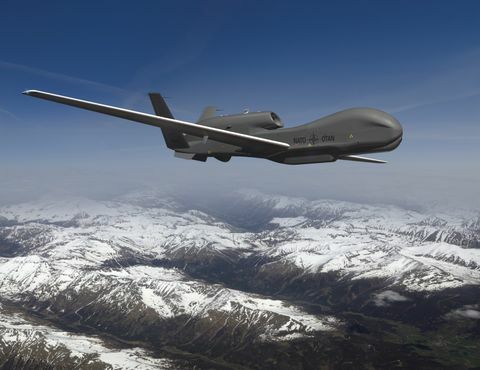 The contract is intended to provide for the purchase and initial operation and maintenance of five Block 40 Global Hawk unmanned aircraft equipped with an advanced ground surveillance radar sensor -- the Multi-Platform Radar Technology Insertion Program (MP-RTIP). Under the contract, European industry contributors will be responsible for development and delivery of the transportable ground stations suitable for in-theatre support directly to commanders of deployed forces, mobile ground stations for close support to moving operations, and remote workstations for higher echelon commands. 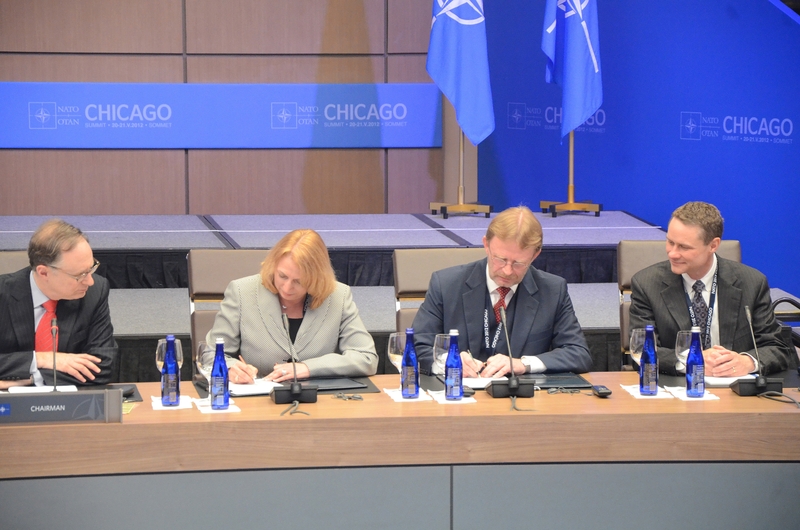 Northrop Grumman and its industrial partners joined NATO leadership and 28 ministers of defense from NATO member countries for the signing today in Chicago. Signed by the NATO Alliance Ground Surveillance Management Agency (NAGSMA) during the NATO 2012 Summit, the trans-Atlantic multinational contract supports NATO's intelligence, surveillance and reconnaissance requirements for multinational theater operations, peacekeeping missions and disaster relief efforts. 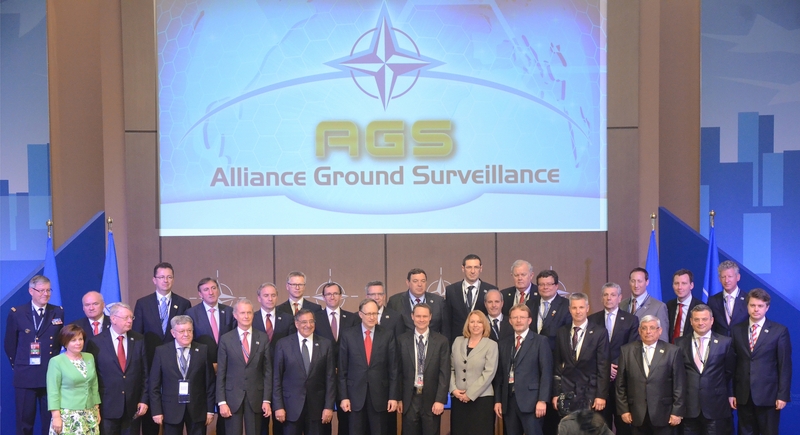 "This Alliance Ground Surveillance program has been a major acquisition priority for NATO. This is an historic moment and we are honored to be bringing this vital, leading edge capability to all NATO member nations," said Otfried Wohlleben, NAGSMA Program Manager. "The real-time long-endurance intelligence, surveillance and reconnaissance that this will provide will be invaluable to NATO forces around the world and the success of their missions." The 13 nations, including Bulgaria, Czech Republic, Estonia, Germany, Italy, Latvia, Lithuania, Luxembourg, Norway, Romania, Slovakia, Slovenia and the United States, are expected to participate in the system's acquisition, and all 28 alliance nations are to participate in the long-term support of the program. "Northrop Grumman and our entire trans-Atlantic industry team are proud to be bringing this strategic capability to NATO and its member nations," said Wes Bush, chairman, chief executive officer and president, Northrop Grumman. "It was our collective goal from the start to ensure an affordable and robust capability that will meet the alliance's need for persistent intelligence, surveillance and reconnaissance to ground, maritime and air commanders, anytime and anywhere in the world. Our team is focused on meeting that commitment." Northrop Grumman will be the prime contractor for the NATO AGS program, and build the Global Hawk air vehicle, supporting systems and payloads including the MP-RTIP radar, which is capable of detecting and tracking moving objects as well as providing radar imagery of target locations and stationary objects. The company's primary industrial team from the 13 nations will include Cassidian, Selex Galileo and KONGSBERG, as well as leading European defense firms ICZ, A.S., ComTrade d.o.o, BIANOR, Technologica, Zavod Za Telefonna Aparatura Ad (ZTA AD), SELEX ELSAG, Elettra Communications, UTI Systems and SES. The ground element, which provides real-time data, intelligence and target identification to commanders within and beyond line of sight, will be wholly produced by European industry, offering direct work in the program for the participating nations. NAGSMA was chartered in September 2009 to acquire the AGS core capability and is responsible for the procurement until it has reached full operational capability. The NATO-owned and operated AGS system is intended to support a broad range of missions, including protecting ground forces, border and maritime security, counter- and anti-terrorism, crisis management, peacekeeping and enforcement, and humanitarian assistance and natural disaster relief. With its main operating base at Sigonella, Italy, NATO AGS will be co-located with the U.S. Air Force Global Hawks and the U.S. Navy Broad Area Maritime Surveillance unmanned aircraft systems, further advancing synergies across the three programs in operational capability, life cycle logistics and sustainment.